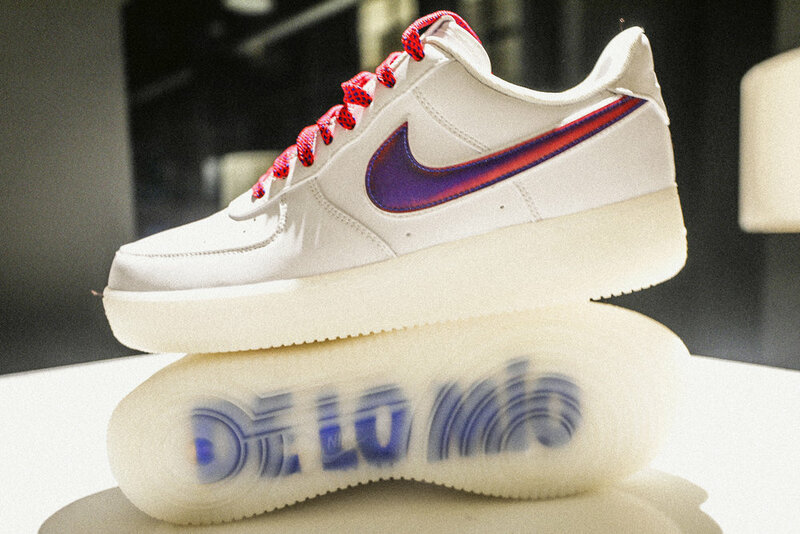 Scrolling through my timeline on November 17th, I am noticing that one in every three posts are about or of the drop of the new DE LO MIO Nike Air Force 1 sneaker inspired by the Dominican Culture. 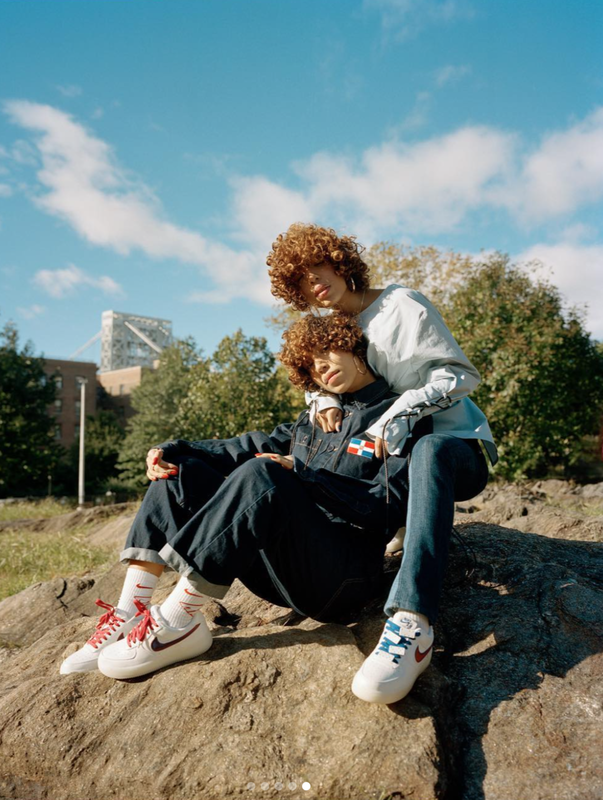 There were photos of the sneaker from all angles, photos of Dominican grandmothers and twin sisters wearing the newly released sneaker, photographers excitingly sharing their photographs after months of production. I wasn’t annoyed by the saturation and overload on my timeline that day because I sensed that purpose, community, and even love was fueling this design and project. Naturally, I wondered about it’s creator, who I found was Cesár Pérez from Queens born in Santiago, Dominican Republic. I reached out to Cesar for an exclusive interview for Loyal Nana about his story and inspirations. Amanda Saviñón: What’s it like to be you today? 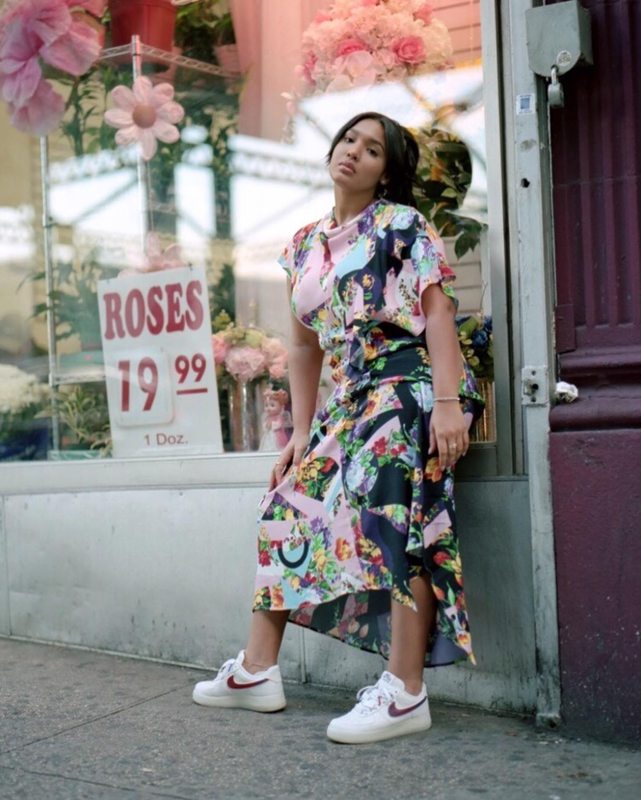 Cesár Pérez: It’s super humbling and dope to be in the space that I’m in today. I’ve accomplished something that, to me was a childhood dream, but it's ended up affecting people in a way I wouldn’t have imagine. 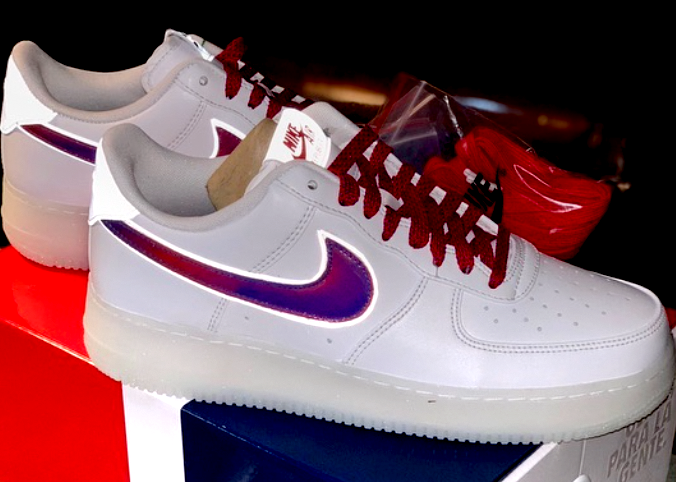 AS: You just did a collaboration with Nike for a remix of the original Air Force 1 sneaker inspired by the Dominican culture. Can you tell us what that process was like for you? CP: It was one of the coolest processes of my life. Nike truly allowed me to have full control and reign. I worked with Al Baik [Sr. Creative Director Nike Sportswear Footwear], and he was my point man for materials. The material that this sneaker uses is water and dirt repellent, and it’s designed that way specifically because my main design inspiration was dominos. If you notice, dominos never get dirty even though they are played with outdoors and constantly slammed on surfaces, they always keep their white color. I wanted the top of the sneaker to be a direct reference to that, and that was the starting point. Originally I wanted a gradient swoosh, and Al told me they have lenticular material and that it was pretty cool. At first, I was against it, because lenticular reminded me of the ninja turtle sneakers back in the day that changed in color when you ran or jumped. At that time, my mom wasn’t able to afford any Nikes, and I saw those ninja turtle shoes as exactly the opposite of what I wanted. Then Al showed it to me, and now the swoosh is lenticular. AS: What was the idea behind the design? CP: I wanted to showcase how different we are as people. There are light skin, blonde hair, and blue eye Dominicans the same way there are dark skin, black hair and brown eye Dominicans. 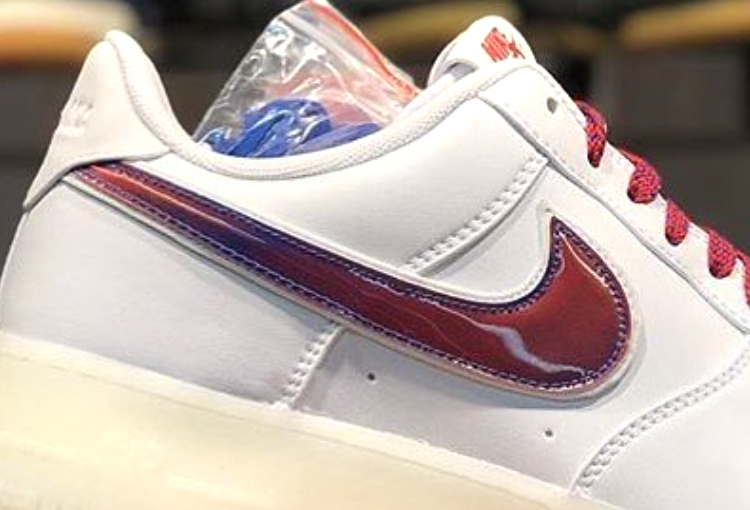 In different lighting, the Swoosh transitions in color not only from red to blue but other colors too. I wanted that to speak to the people. AS: It looks purple sometimes too, and I think royalty! My favorite part is the De Lo Mio quote underneath the right sneaker, how did that come about? CP: I wanted to cross-brand a lot. I wanted it to have the Swoosh and something Dominican next to it; I wanted that mix. I put the Swoosh on the bottom of the left sneaker and the De Lo Mio on the bottom of the right because I wanted that combination of a very American company [NIKE], with a very Dominican saying [De Lo mio]. I had a couple of other different ideas for the bottom, but there’s a friend of mine, and every time he used to see me, he would say ‘De lo mio! De lo mio!’ I noticed he also said that to me any time he would see me doing something cool... his response would always be “De lo mio.” That stuck with me because I saw he was genuinely happy that I was growing and elevating. AS: I love that you placed 'De lo Mio' right under our feet, holding us up. There’s a lot to this shoe, and I love that you kept it white, you didn’t do any red, or blue, and also no flag, it’s tasteful. CP: I threw out crazy ideas like making all the stitching 3M which is the silver colored reflective material that lives behind the Swoosh and shines when the light hits it. I also thought the white laces were going to be my favorite, but I love wearing my sneakers with the red and blue intertwined laces. The shoes come with lace options. AS: How long did the De Lo Mio project take from conception to launch date? CP: Honestly, this year has been the toughest year of my life because I’ve been working on this project and I couldn't tell anyone. CP: I want to thank Nike so much because they really trusted and believed in me and literally let me do whatever I wanted from the shoe, to the tissue, to the packaging. It’s been crazy. I’m very blessed. AS: Speaking of staying focused and being blessed, I saw you went vegetarian two years ago! Has it been hard for you as a Dominican? The Dominican diet is like 96% meat and dairy products. CP: The only time it is hard is when I go into a Dominican restaurant. But for me, the decision came from wanting to evolve, and be a better person. It was when my aunt died of cancer that I went veggie. My Aunt was a woman that didn’t drink, didn’t smoke, didn’t go out, she did everything right, and she still got cancer. I asked myself, “Why is cancer so common in the human body regardless of lifestyle?” “What is the one thing we all share?” --- It’s food. I started to research what food is and what we need as humans for our bodies to run... So I gave up meat and fish and was very proactive about being a healthy vegetarian, it's easy to be an unhealthy vegetarian. I felt way better just three months into it, so there is no going back. Except for when I go to France…I have to have the steak. AS: In my opinion, especially diet wise, all bets are off when traveling! You founded 625 Industries. What is it? CP: 625 Industries is a creative agency; an innovation company that does a lot of different things. Nike’s a client of mine as well as Levis and Barney's to name a few. For Nike for example, we produce creative workshops all over the world. We do other types of creative consulting and design for them and other clients as well. AS: Lit!! 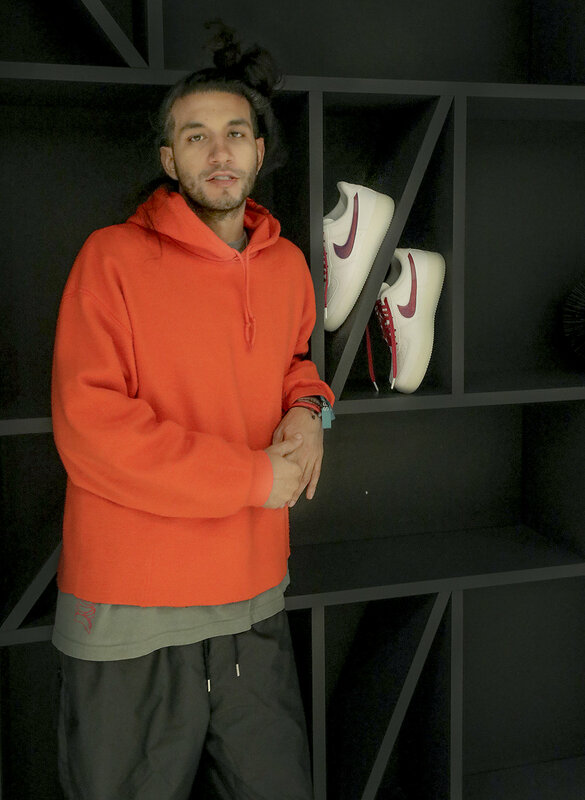 This collaboration with Nike brought a lot of attention to you, and the work you do with your company. What were some other things you were doing before this that maybe didn’t get as much attention? 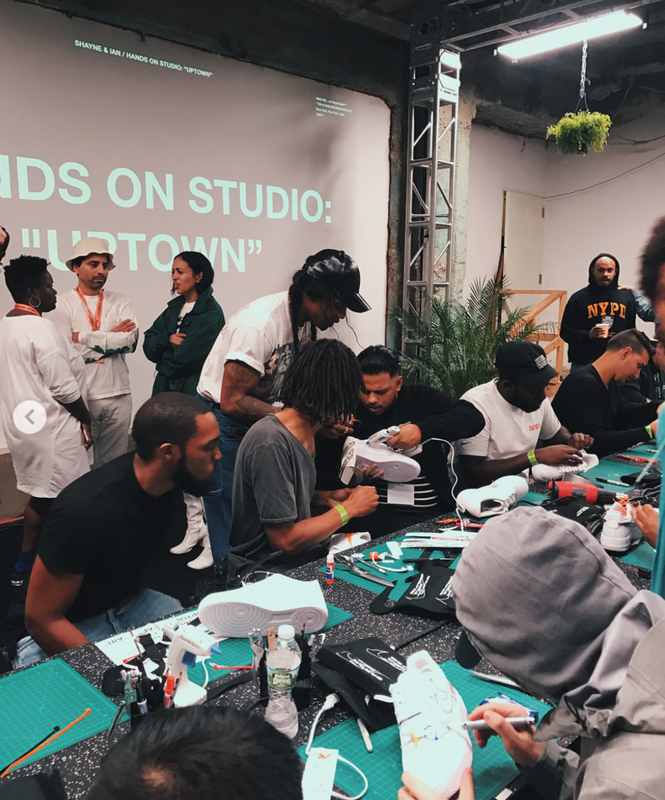 CP: I conceived, developed, and sourced all materials, for the first version of Virgil Abloh’s ‘The Ten’ collection workshops for NIKE OFF CAMPUS. That got a lot of attention and press, but my name wasn’t on it like it is with these sneakers. AS: Wait... I went to that! It was epic- the panels, the workshops, the set up. I remember navigating the very dark room where every one of the ten sneakers were displayed and lit up individually; it felt like these sneakers were Basquiat, Kehinde Wiley, Picasso, Warhol pieces in a museum. Each had a stage and a storyline. 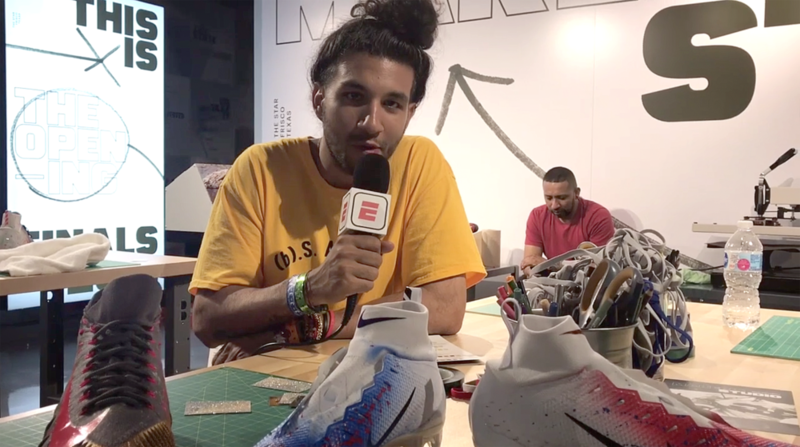 CP: That was upstairs, and in the basement, we had this studio set up where people could come in and customize sneakers. It was the first time that you could do whatever you wanted to Nike product including stuff they never allowed before. AS: Like detaching the swoosh!!! CP: Yup. 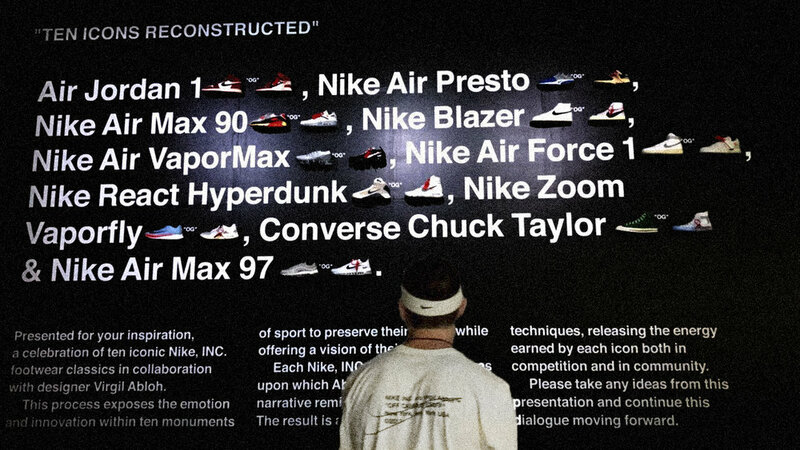 Nike gave me the opportunity to conceive that workshop, and that was my first major opportunity. It got the ball rolling. AS: And now you are here, as the designer of a version of the classic, international Air Force 1 sneaker that first launched in 1982 [created by Bruce Kilgore] and you are building community today from history. 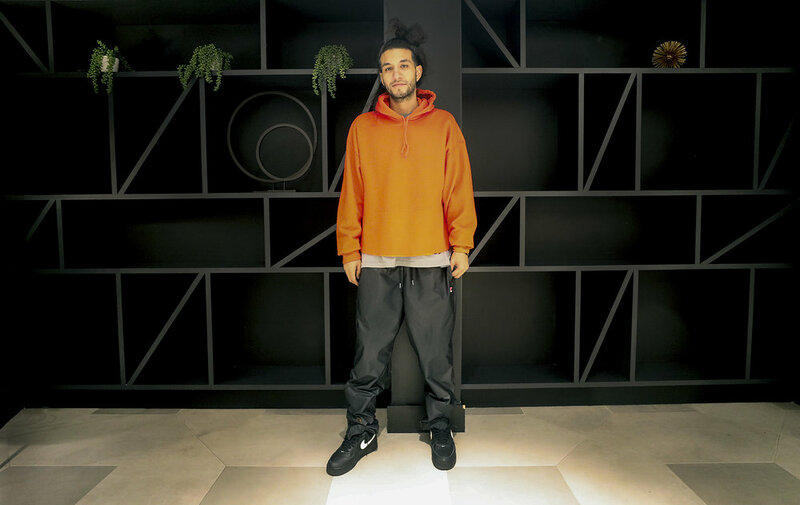 Today you posted a photo of your first meeting with the six young, Dominican-American photographers you chose to photograph the sneaker. Why did you decide to not only design the shoe but also be in that marketing part of the project? CP: I wanted this project to provide our people with opportunities too. And I wanted to make sure of it because we got so much to give. For instance, we had the launch party for the De Lo Mio sneaker uptown at La Marina on Dyckman Street. 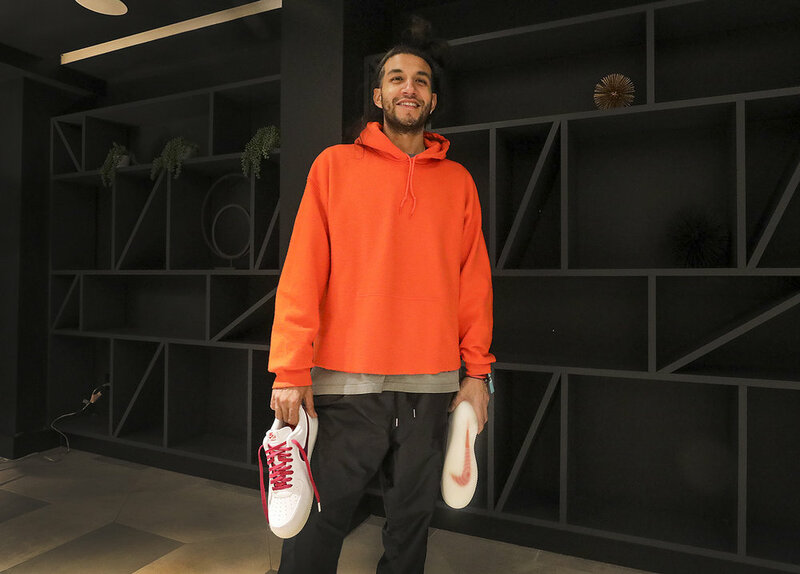 Nike said, “We’re going to do a party for your sneaker.” I said, “Alright, let’s just pick a party that’s already happening” and that’s why we brought Tony Peralta and Jose Morales into it because they were doing that party already in the hood. AS: You know what the difference is between you making this shoe and the next person making this shoe? If a Brett from Brooklyn had headed this particular project, he would have totally curved the Dominican community, there probably wouldn’t have been a party at La Marina (the only place it actually makes sense to have it), Tony and Jose wouldn’t have been included, the photos would not have been taken by Dominican photographers... But it was you. You turned this into infinite energy and love for our own. The magic hasn't stopped. AS: What advice would you give young artists or designers out there putting in work and might be discouraged by the lack of diversity in their industries or maybe have a crippling fear of not being good enough? CP: Yes, Baby MJ! Felipe is also from Queens, and he played such a significant part in my life. I loved basketball and grew up my entire life playing ball. Felipe was a large part of my love for basketball. Even before he got drafted! I remember when he was playing at St. John’s University in Queens. To me, he was the biggest star on the planet – the universe. 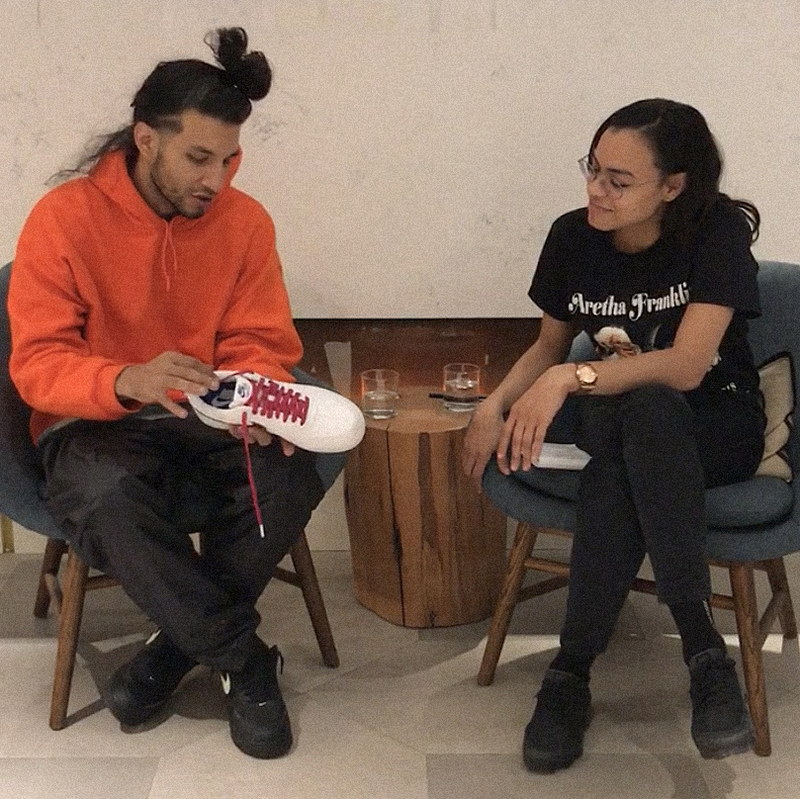 AS: He broke glass ceilings as a Dominican-American, you’re doing the same thing now with your sneaker just like Tony Peralta, Lucia Hierro, Renell Medrano, and Uzumaki Cepeda for example, are doing in their respective creative fields. These are only some of my contemporaries that make me proud to be Dominican. How does this rollercoaster ride feel for you? What are some of the crazy things that are happening? CP: It’s all crazy. Especially moments when I am meetings and talking with some of my childhood idols. I had dinner with Felipe; he invited me to his birthday. Jay-Z’s my favorite rapper. I took a lot of heat for being a Jay-Z fan, growing up in Queens, but I knew Jay had a Dominican dude next to him [former Roc Nation president ‘OG Juan’ Pérez] and because of that I‘ve always rocked with him. I sent Jay a pair of sneakers on a Thursday planning for them to arrive on a Friday. 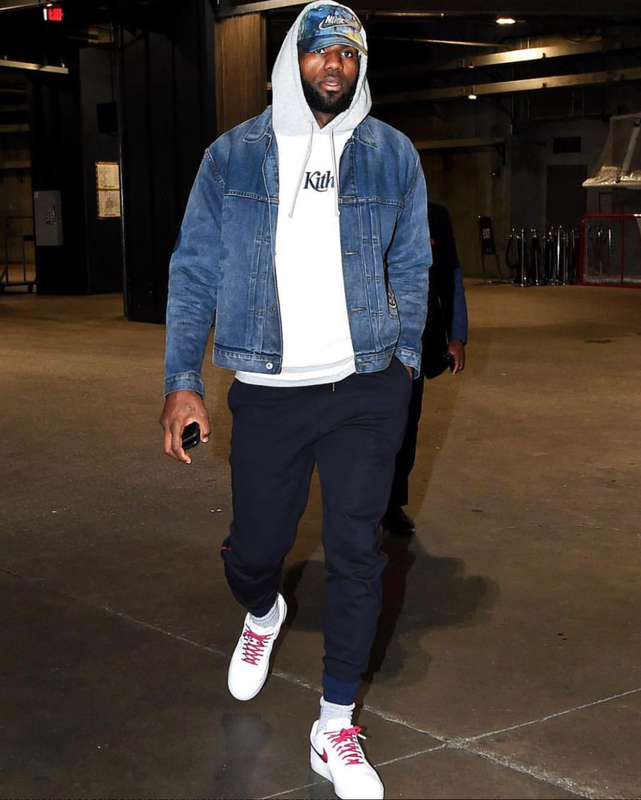 For whatever reason, they didn’t go out, and I got a text on Tuesday like, “Jay-Z didn’t get his pair” and I was like “He’s asking about my sneakers? !” Jay’s an honorary Dominican. AS: So obviously with good work comes both good and bad press. Is there any negativity coming your way about this project? Any haters? Anything weird? CP: It’s nothing weird. This shoe isn’t about me at all regardless of the significant role I played. I remember talking to the Nike [communications] team during some of our meetings and them saying things like “this is a shoe inspired by your life and times...” Hearing that I thought, 'that's insaaaane.' I design Nike sneakers for my people, and I don’t care who says what as long as the vision is represented well and I am speaking my truth. AS: What was your first memory with the Air Force 1? CP: At my house, every Friday night there used to be card games and I used to serve the drinks to get tips. So I saved the money, and I bought a pair of the mid-top [Air Force 1’s], my favorite Air Force. They were white and red, and I thought I was the coolest kid!!!! I’ll never forget it. 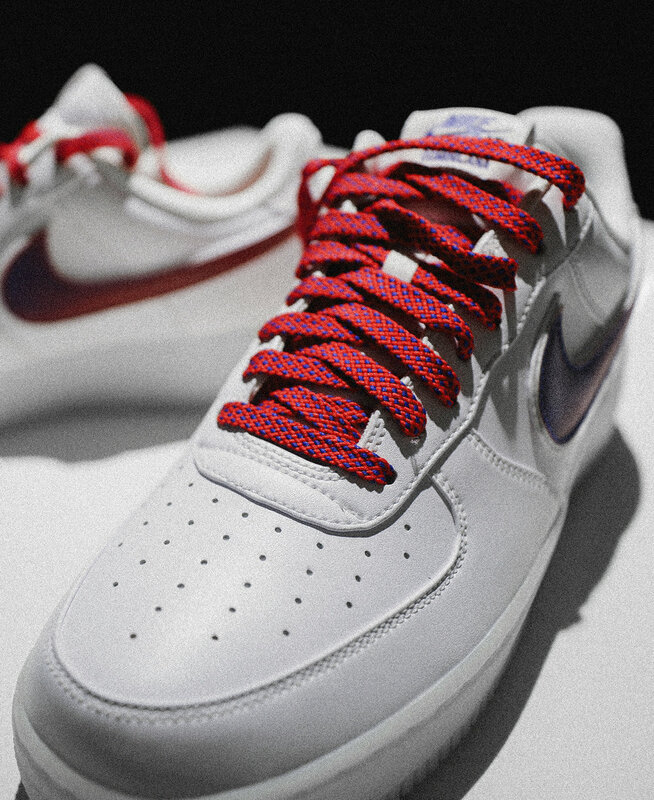 I used to wear a Hawaiian shirt, khaki cargo shorts, and these white and red Air Force 1 - like too much. AS: You should totally recreate this outfit as an adult. Are you single? CP: I am single, but I will say, I’m super focused and busy. AS: Y’all heard it here first people, don’t be sliding into his DM’s! AS: Oh, so they CAN slide into your DM’s? AS: What is a day in your life? CP: My days are crazy - I get up at 8 am, I go to bed at 3 am, I run around the whole city, I’m working on different time zones, I’m on the phone. My assistant can attest to it; she probably hates me – shout out to P, she’s the best person in the world. AS: I noticed you take pride in creating things that are innovative, unconventional and jut. I read that before starting any project you ask yourself, “Okay what hasn’t been done? What can I do to make this mine?” and I love that because it forces us to research and to go deeper into our creative portals. Where do you find inspiration when you need it? CP: Honestly, my inspiration comes from New York City and my people. You can’t go wrong there. The rest of my inspiration comes from traveling, gathering, and even Google. I search a word and go through the images. AS: What’s next for you and 625 Industries? CP: Finding as many like-minded people who share similar beliefs. As much as it’s a company with really good clients, it's ultimately about trying to make it better for everybody, better for me, better for the people who work for me, better for the people who work with us, better for the world. It’s all about putting your energy into what you’re meant to do versus all this other noise that is happening in our world today. Put your energy into the things you love, and it’ll become a cycle. AS: I feel good for you. We can talk forever and ever and ever and ever. Thank you for sharing your time. Watch parts of this interview on Loyal Nana’s IGTV Channel.